The GDPR fundamentally changed the data privacy landscape, but that was clearly just the beginning. The recently approved California Consumer Privacy Act firmly plants similar rights in the US market, and other global regulations demonstrate that we are in a new era of data privacy.? It’s time for a paradigm shift in our approach to data ownership and rights. The TrustArc Privacy Workshops are designed to help businesses achieve, demonstrate, and manage ongoing compliance for the EU GDPR and other regulations and frameworks, including Privacy Shield and CCPA. The free workshops provide informative guidance, peer discussions, and practical solutions on how to operationalize privacy program management along with examples of how companies are using privacy technology tools to help automate compliance. The U.S. Department of Commerce will be joining as presenters for Workshops in Boston, Washington DC and New York. Topics to be covered in the workshops include: Data Mapping, Records of Processing, DPIA / PIA Management, International Data Transfer, Individual Rights / Data Subjects Access Rights Management, Consent Management, and Compliance Reporting. This year’s multi-day IP Institute celebrates the diversity of IP in our lives and culture by offering outstanding educational programming as well as multiple fun networking events. This year’s Institute provides a wide range of speakers and presentations on patent, copyright, trademark, trade secret, internet and privacy, cybercrime, technology transfer, licensing, music and entertainment, IP specific ethics, and more. TrustArc Senior Counsel Darren Abernethy will be speaking on “GDPR: Lessons Learned From the Front Line” on Thursday, November 8th at 10:05am. The CIO Event brings together technology leaders from across the public, large enterprises & mid-market sectors and will provide you with a strategic and practical toolkit to help drive transformation including CIO’s discussing the latest industry trends, workshops, panel discussions & Round table sessions led by visionaries within technology, first-hand case studies on the challenges facing IT andantastic networking opportunities with peers throughout the day. TrustArc & GDPR Edge are sponsors and will be speaking at this event. In an increasingly digital economy the issue of data protection and privacy is becoming ever more important. 2018 has seen the biggest change in data protection and privacy for two decades and it’s having a global impact on organisations of all sizes. The European Union General Data Protection Regulation (GDPR) came into force on May 25 of this year and it impacts nearly every organisation. TrustArc SVP of Sales & Consulting Eleanor Treharne-Jones will be speaking on “Fit for GDPR: Lifestyle not a Sprint” on Wednesday, 20th November at 9:40 and “What next? Continuing the GDPR compliance Journey” at 16:05. TrustArc is sponsoring the GDPR Refresh and GDPR Advanced Theaters, speaking and exhibiting at this event. Stop by booth 46 to say hello! This year’s EDAA Summit will host sessions that cover topics such as: GDPR, ePrivacy, managing consent, and many more. TrustArc will be sponsoring at this event. Come to learn, come to network, and come ready to share your experiences. 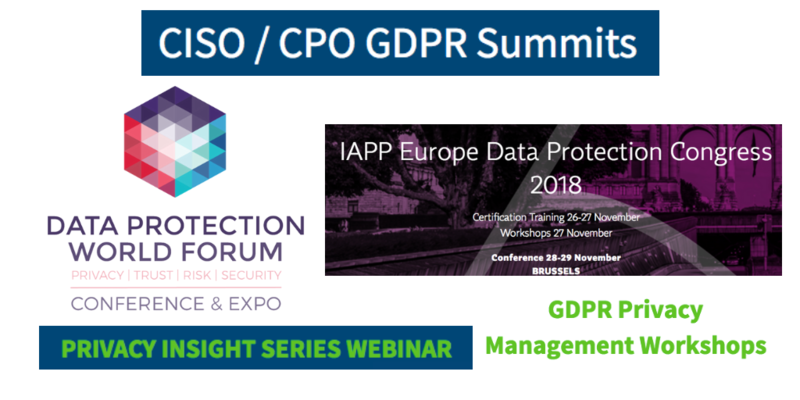 Look forward to practical direction for the GDPR era and success stories from your peers, as well as the high-level discourse delegates have come to expect from the Congress. TrustArc Director, International Regulatory Affairs, Josh Harris will be speaking on “APEC-EU Work on Certifications: Using CBPRs to Facilitate GDPR Compliance” on Wednesday, 28th November at 15:30. TrustArc General Counsel and Chief Data Governance Officer Hilary Wandall will be speaking on “Quantifying GDPR Operations” on Thursday, 29th November at 14:45. TrustArc Senior Consultant Julian Hicks will be speaking on the Little Big Stage on “Simplifying Privacy Management through Automation and Intelligent Technology” on Thursday, 29th of November at 10:05. TrustArc is sponsoring, speaking and exhibiting at this event. Stop by booth 28 to say hello! In this highly-connected world, there is potential for even the most secure networks to be compromised. With the GDPR bringing increased fines and heightened consumer expectations on how consumer data is handled, there’s additional pressure on your company’s cybersecurity strategy to stay one step ahead. A focus on preventative measures needs to become more sophisticated with a multi-layered approach to cybersecurity and ongoing risk management. In this webinar we’ll look at the role the CISO plays in managing GDPR compliance, the role of tools such as anonymisation and integrated assessments, and how the privacy team can partner effectively with the security team.